If you think that God commanded the death penalty for certain offenses in Old Testament (OT) Israel or commanded Israel to drive out the Canaanites with coercive force, then, according to pastor and theologian Greg Boyd, you’re quite mistaken. 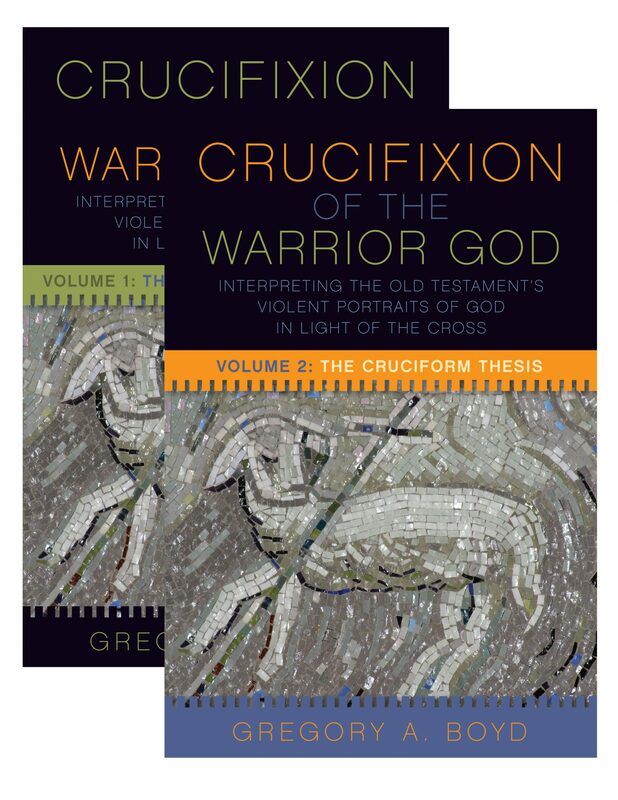 In his two-volume book, The Crucifixion of the Warrior God: Interpreting the Old Testament’s Violent Portraits of God in Light of the Cross, Boyd argues that such “violent” injunctions come from the “textual” God of the misguided ancient Near Eastern biblical author with his fallen, violence-prone worldview (“thus says Moses/Joshua”). These aren’t instances of “thus says the Lord”—the “actual” God whom Jesus represents. Boyd’s “cruciform” hermeneutic emphasizes how the character of God is displayed in the power-surrendering, non-violent, self-giving Christ on the cross. If this is what God is really like, then we must rethink how we view violent OT texts—and even certain New Testament (NT) passages. Fortress Press (2017). 1,492 pp. $59.00. Gregory A. Boyd proposes a revolutionary way to read the Bible in this study. His “cruciform hermeneutic” challenges the field of biblical studies and all thoughtful Christians. Developing a theological interpretation of Scripture that he labels a “cruciform hermeneutic,” Boyd argues that the Bible’s violent images of God are reframed and their violence subverted when interpreted through the lens of the cross and resurrection. Indeed, when read in this way, Boyd argues that these violent depictions bear witness to the same self-sacrificial nature of God that was ultimately revealed on the cross. Boyd adopts what he calls the Cruciform view, starting with the loving, power-surrendering, non-violent Christ on the cross, who reveals the character of God (1 Cor. 1:22–23; cf. John 14:9; Heb. 1:1–3). Boyd then works his way backward with a cruciform hermeneutic to interpret OT violent texts in light of the cross. He supports this approach with four theses. First, God accommodates himself to a culturally conditioned, violence-prone ancient Near Eastern people—including the biblical writer or prophet—eventually revealing, through the crucified Christ, that all such “violence” is evil. What seems God-glorifying and heroic in one era turns out to be demonic when seen through the lens of the cross (84). Large portions of the OT reflect the ancient Near East author’s viewpoint (“the textual God”) rather than God’s true, non-violent, loving character (“the actual God”). Second, God withdraws (“hides his face”) and allows other agents (e.g., human armies, demonic forces) to carry out the violence in their hearts (1256). God permits or allows, but “never causes,” violence (1136). So what appears to be God engaging or being complicit in violence is nothing more than fallen creaturely actions. On this second point, we can concur to some degree. For example, although we read that “God” incites David to take a census (2 Sam. 24:1), we read that it was through “S/satan” (1 Chron. 21:1). Third, cosmic conflict occurs not only at the cross, which casts down Satan; God also withdraws, and demonically inspired violence takes place through the “destroying angel” in Egypt’s plagues, Noah’s flood, the demise of Sodom and Gomorrah, and the death of Korah and his fellow rebels (1257). Because the Israelites viewed their enemies as “flesh and blood” rather than as demonic powers and so trusted in the sword to fight against them, God gave them over to their own hardened violent hearts (1094). The fourth thesis is the principle of semiautonomous power: although Christ refused to resort to divine power to rescue him from death (Matt. 26:53), not all of God’s representatives have been so restrained. God gives them power, but they misuse it: Moses’s powerful staff brings water from the rock but through a spirit of unbelief (Num. 20); Elijah calls down fire from heaven (2 Kings 1); Elisha calls out bears to maul a group of youths (2 Kings 2). These violence-prone authors misread God’s kind intentions and abuse their God-given powers (1260). Using this cruciform lens, Boyd attempts to use the “conservative hermeneutical principle” by appropriating the NT authors’ Christocentric hermeneutic toward the OT—the fuller sense (sensus plenior)—without violating the literal sense (sensus literalis) of the OT author. In a recent two-part radio conversation I had with Boyd, he admitted he should have addressed important biblical passages missing in his treatment. At a number of points he downplays certain continuities between the Testaments that emphasize divine “severity” (Rom. 11:22). While I can only touch on some of these, I did present in condensed form a 19,000-word paper at the 2017 Evangelical Philosophical Society annual meeting; I shall offer a further response here. Boyd claims the imprecatory psalms are in “direct contradiction to Jesus” (328). Insofar as they call for personal vengeance—though often using hyperbole and venting white-hot emotions—I’d agree that they contradict the spirit of Jesus, as I have written here and here. Contrary to Boyd’s claims about me, I don’t endorse imprecatory psalms carte blanche. Yet I believe that NT authors like Peter (Acts 1:20) and Paul (Rom. 11:9–10) rightly draw on the imprecatory psalms to reflect the theme of calling on God to repay evildoers according to his just promises. As N. T. Wright notes: “[E]vil is real, and some people are so wicked that we simply must wish judgment upon them.” The martyrs in heaven call on God to do this—to avenge their blood (Rev. 6:10). To pray that God would work redemptively in evil human hearts . . . doesn’t contradict the prayer that, if necessary, God would bring an end to them in judgment if they persist in their evil. Alongside his call to love enemies and pray for persecutors, Jesus affirms the rightness of believers’ prayers “day and night” for God to “bring about justice” (Luke 18:7–8). To pray that God would work redemptively in evil human hearts (say, those of ISIS terrorists) doesn’t contradict the prayer that, if necessary, God would bring an end to them in judgment if they persist in their evil. Absent personal vengeance, it is a right impulse for the imprecatory psalmists to ask God to judge the wicked, fulfilling his promise to repay evildoers according to their deeds. This is one point of continuity between the testaments that Boyd diminishes. Boyd’s understanding of vengeance seems confused. He makes the point that in Luke 4, Jesus deliberately—and significantly—leaves off “the day of vengeance” when citing Isaiah 61 (88), as though divine vengeance must be opposed to the gospel. Thus Boyd chastises the apostle Paul for asserting that God will deal out “retribution [’ekdikēsis]” to the Thessalonian believers’ oppressors (2 Thess. 1:6–9): “[Paul] seems to be satisfying the Thessalonians’ and/or his own fallen thirst for vengeance to come upon their enemies” (589). Yet God says that “vengeance [’ekdikēsis] is mine” (Rom. 12:19; Heb. 11:30). If anything, Boyd should chastise the redeemed martyrs, who are actually petitioning God to “judge [krineis] and avenge [’ekdikeis] our blood” (Rev. 6:10). Indeed, he should oppose the satisfaction of “heaven . . . and you saints and apostles and prophets” at God’s just judgment: “Rejoice over her . . . because God has pronounced judgment [’ekrinen . . . to krima] for you against her” (Rev. 18:20). That believers shouldn’t take personal vengeance, but to call on God to bring judgment, is anchored in both Testaments and in Jesus himself. As part of his ‘cruciform hermeneutic,’ Boyd needs to recover an emphasis on the severity of God. Boyd considers it anti-cruciform that God (in Deut. 28:63) would be equally delighted to “prosper and multiply” Israel or “make you perish and destroy you” (883). Yet this point needs qualification. Two chapters earlier, God urges Israel to “choose life in order that you may live” (Deut. 30:19). Indeed, God doesn’t desire the death of the wicked (Ezek. 18:23; 33:11). Yet we’ve seen the NT itself express a fittingness in rejoicing over God’s just judgment on the unrepentant inhabitants of “Babylon” who have opposed God and persecuted his people (“Rejoice over her”). As part of his “cruciform hermeneutic,” Boyd needs to recover an emphasis on the severity of God. Given Boyd’s thesis, we should ask: Where does the NT give the impression that Moses is so utterly and even demonically misguided that he leads the Israelites into immoral bloodletting in the name of Yahweh? This is of a different order than, say, God’s incorporating into the outworking of his sovereign purposes Israel’s grievous rejection of his leadership by insisting on a king (1 Sam. 8:7). No, God didn’t initiate the demand for kingship, but rather worked with the Israelites’ fallen desires. This event would result in the eventual establishment of David’s rule—and that of David’s greater Son, the Messiah King. But this is quite different from God’s using the Israelites to bring judgment on “those [Canaanites] who were disobedient” (Heb. 11:31). Given Boyd’s thesis, we should ask: where does the New Testament give the impression that Moses is so utterly and even demonically misguided that he leads the Israelites into immoral bloodletting in the name of Yahweh? Boyd fails to follow Jesus’s hermeneutic concerning Moses, about whom he and other NT authors speak with unqualified praise (Matt. 23:2–3; cf. Matt. 8:4; Luke. 16:31; John. 5:45–46; 7:19; cf. Heb. 3:5: “Moses was faithful in all [God’s] house as a servant”). Like Jesus (Matt. 19:8), Paul knew that the law was not ideal. To use N. T. Wright’s image, the law was like a booster rocket to establish Israel in its nationhood, theology, institutions, and practices that paved the way for the Messiah and the creation of an interethnic people; once the law’s purpose had been accomplished, it was set aside. Nevertheless, Paul considers the Mosaic law “spiritual” (Rom. 7:14) and “holy and righteous and good” (Rom 7:12; cf. 1 Tim. 1:8). Yet Boyd’s version of Moses makes it difficult to distinguish Moses (or Joshua or Samuel) from a false prophet leading Israel to engage in wicked behavior in the name of the Lord (cf. Jer. 23:16). 4. Sermon on the Mount: Repudiation of the Mosaic Law or Misuse? For example, Boyd claims Jesus disavows all vowing and swearing (1048). So rather than “fulfill[ing] your vows [tous horkous] to the Lord,” we are not to “swear [omosai] at all”; all such swearing—going beyond “yes” and “no”—is from the evil one (Matt. 5:37). However, Jesus doesn’t oppose the Mosaic law on this point—but only the kind of casuistic oath-taking that was an escape-hatch from truth-telling. (Jesus elaborates later in Matt. 23:16–22.) The identical language used in the Sermon is used of God himself making oaths and swearing by his own name—to Abraham, David, and so on (Acts 2:30; 18:18; 21:23; cf. Rom. 1:9; Heb. 6:17; 7:21, 28; Rev. 10:6). The same goes for Jesus’s apparent renunciation of lex talionis—“an eye for an eye.” Jesus chastises those attempting to justify personal vengeance by incorrectly appealing to OT judicial texts. The Mosaic law applied the proportionality principle in judicial rulings—and typically not applied literally (cf. Ex. 21:22, 27), except in cases of capital punishment (“life for life”). The OT assumes loving one’s enemy can exist alongside the use of coercive force—just as the NT does (e.g., Rom. 12 and 13). Jesus knew that the Mosaic law distinguished between loving one’s personal enemy (Ex. 23:4–5; Lev. 19:17; cf. Prov. 25:21–22)—and using appropriate legal/judicial punishment. In judgment, God himself operates by the proportionality principle, rendering to everyone according to what he has done (Rom. 2:6; Rev. 16:5–6). The apostle Paul himself illustrates this personal–official distinction in Acts 23: when his own life is under threat, he doesn’t take matters into his own hands but calls on the Roman military to do its God-given duty to protect innocent citizens, lethally if necessary. Paul’s understanding of cruciformity apparently isn’t so narrow as Boyd’s. Paul’s own understanding of cruciformity apparently isn’t so narrow as Boyd’s. Even so, Boyd denies that the “actual God” could have commanded capital punishment in Israel (577), yet that is exactly the opposite of what Jesus says: both honoring one’s parents and also putting to death those who curse them are “the commandment of God” (Matt. 15:3). Peter, likewise, assumes the divinely mandated death penalty (Acts 3:23 [“destroyed”]) as does the author of Hebrews (“every transgression and disobedience received a just penalty” [Heb. 2:2–3; cf. 10:28–29; 12:18–20]). While certain OT punishments could be commuted to monetary payments, it wasn’t always so—particularly, for murder. At any rate, this sampling of texts goes against Boyd’s claim that divine punishment is never retributive—only redemptive and restorative (783). What about loving one’s personal enemies (Matt. 5:43–48)? Though Boyd gives the impression that Jesus came up with this new ethical view, Jesus is actually reflecting teaching from the OT, including the Mosaic law (Ex. 23:4–5; Lev. 19:17–18; cf. Prov. 20:2; 24:17–18; 25:21–22). The OT assumes this personal-official distinction. As for turning the other cheek, cheek-striking wasn’t an act of violence but rather a shaming insult (Job 16:10; Ps. 35:15; Lam. 3:30: cf. Isa. 50:6). And when Jesus is actually struck, he doesn’t “turn the other cheek” but demands to know the reason (John 18:22–23). Boyd advocates not resisting the evil person (Matt. 5:39), although this verse is better translated “do not/not to resist by evil means.” This makes more sense since Jesus resists evil persons—his forceful, less-than-gentle temple-cleansing, for example, which isn’t exactly a picture of Boyd’s version of cruciformity. The book’s subtitle notwithstanding, Boyd never actually defines the term “violence.” In the aforementioned radio discussion, he admitted this problem but claimed that we can recognize violence when we see it. However, Boyd’s definition of immoral “violence” includes activities not obviously immoral to many of us: the use of (potentially lethal) coercive force in self-defense (cf. Paul benefiting from military protection [Acts 23]); defending those in harm’s way (cf. the implied use of coercive force required to “[r]escue those being led away to death” and “hold back those staggering toward slaughter” [Prov. 24:11]); policing; and just war as an act of love to protect the innocent. So, yes, since coercive force can be just or unjust, a definition of violence would’ve been most helpful. As philosopher Elizabeth Anscombe noted, the problem with pacifism is that we can’t distinguish between the shedding of innocent blood and the shedding of any blood. Thus, Romans 13:4–6 presents rulers of the state as “servants of God”; they are an “avenger” bearing the “sword”—a metaphor for lethal coercive force; that is, the state has a God-given duty to protect innocents and punish criminals, and when the state does this, it’s a good thing. When the government punishes evildoers, protects the innocent, and keeps the peace, it does its God-given duty (Rom. 13:4), and this is why “you also pay taxes, for the authorities are ministers of God, attending to this very thing” (v. 6). Boyd thinks the appeal to positive NT soldierly examples such as the Roman centurion’s faith (Matt. 8:8–10) and Cornelius (Acts 10) as support for justified coercive force isn’t compelling but is just an argument from silence (580); after all, Jesus keeps company with tax-gatherers and prostitutes as well. But if so, John the Baptist—who wasn’t afraid to confront a pagan ruler’s immorality (Mark 6:18)—missed a key opportunity for soldiers to forsake “violence” (Luke 3:14). Why focus on lesser evils like extortion or discontentment with wages? If soldiering or policing is on the same moral level as prostitution (which NT scholar Richard Hays has maintained), why would Paul seek assistance from the Roman military (Acts 23)? Would Paul say “Who at any time serves as a prostitute at her own expense?” (cf. 1 Cor. 9:7) or “No prostitute in active service entangles herself in everyday affairs” (cf. 2 Tim. 2:4)? Would Jesus teach lessons about discipleship by referring to a pimp counting the cost before starting a prostitution business (Luke 14:31)? On a historical note, Boyd assumes that no known pre-Augustine author defends Christian soldiering or violent engagement, that Christian soldiering then was not widespread, and that pacifism was the general Christian consensus (e.g., 123–24). This is incorrect. For example, Tertullian noted Christians could be found everywhere—including “fortresses [castella]” and in the “military camp [castra]” (Apol. 37). Clement and Dionysius (both of Alexandria) do defend Christian soldiering. Indeed, the pre-Augustinian pacifistic general consensus turns out to look more like a mixed bag, like much more textured terrain, as Daryl Charles argues. Boyd’s “pre-Augustinian” timeline is erroneous as well. Boyd tries to pin on Augustine the origins of a Christianized just war theory; this, he claims, was influenced by Greek philosophical concepts of both an impassible, immutable deity and Augustine’s (later) strong predestinarianism, by which God’s “perfect love” could “predestine innumerable people to unending torment” (149, 151). Actually, it was Augustine’s mentor Ambrose who began to develop just war theory. Though also influenced by Neoplatonic thought, Ambrose espoused a more “libertarian” view of the will, emphasized love of neighbor and deeds of mercy as the basis for just war theory and true soldiering, considered it damnable for a Christian not to forcefully intervene to protect the innocent, and even—like his pupil Augustine—rejected self-defense as justification for coercive force. Cruciformity reveals a non-violent Jesus, Boyd affirms, yet we see a Jesus who engages in forceful ways in the NT. Jesus is forceful in the temple-cleansing: overturning tables, driving out animals and moneychangers, preventing people from entering the temple. Though his book doesn’t discuss the striking down of Ananias and Sapphira, Boyd elsewhere claims Peter misused divinely given power. But why think that? After all, “the hand of the Lord” struck Elymas blind (Acts 13:11). It seems that Boyd would likely consider this a case of Paul’s misusing divinely given “semiautonomous power.” Furthermore, the “non-violent” Jesus threatens to cast the false teacher Jezebel on a “sickbed” and “strike her children dead” (Rev. 2:22–23). Boyd sees the book of Revelation endorsing pacifism, claiming, for instance, that the blood on Jesus’s robe in Revelation 19 is his own shed blood (622–23). But this is a strained interpretation. For one thing, Jesus’s words in Revelation 2:20–23 as well as his un-gentle rule of the nations “with a rod of iron” (Rev. 12:5) suggest caution about labeling Jesus “pacifistic.” Second, this blood should be understood in light of an earlier vision in Revelation 14:15–20, where angels from heaven are sent to “put in your sickle” to gather grapes from across the earth and throw them “into the great winepress of the wrath of God,” such that “blood flowed from the winepress” (19–20). What about specific OT texts? Boyd claims that when Yahweh says, “I want you to enter the land of Canaan,” the culturally conditioned ears of violence-prone Moses and the ancient Israelites heard, “You must mercilessly slaughter the indigenous population” (979). Boyd claims that these fallen Israelites put their trust in the sword—contrary to God’s command. This is mistaken. As we’ve seen, Jesus said the Israelites, not Moses, were hard-hearted (Matt. 19:8). Also, when God wants to wipe out the Israelites after the golden calf incident, Moses pleads with God not to do so (Ex. 33). Moses appears to be more “non-violent” and “cruciform” than the God with whom he is arguing. Surely, Boyd wouldn’t say that this is due to God’s “low spiritual state and high degree of cultural conditioning” (979)! Far from being violence-prone and “trusting in the sword,” the Israelites could do nothing but resort to coercive force (“the sword”) to protect themselves from Amalekite attack (Ex. 17), but they were trusting in the Lord for deliverance, as evidenced by Moses’s intercessory prayer. And despite their peaceable intentions, the Israelites had to fight against Sihon and Og, who nevertheless came against them with force (Num. 21:21–35). Such scenarios don’t fit Boyd’s paradigm. Indeed, both the OT and NT indicate that trusting in the Lord isn’t opposed to using coercive force (e.g., Josh. 24:12; 1 Sam. 17:47; Ps. 44:2–6; Acts 7:45; Heb. 11:30–31, 33–34). Second, Nehemiah 9:22 indicates that God had given Israel “kingdoms and peoples,” including the lands of Sihon and Og (v. 22); apparently, God gave them these lands as he desired. Third, the word desire (ratson) isn’t inherently negative (e.g., Ps. 145:16, 19). This same expression is used in Esther 9:5: Jews under Persian rule killed hostiles “as they pleased”—that is, without official interference but with certain restraints: “they did not lay their hands on the plunder” (Est. 9:10, 15–16). Boyd claims God intended that, rather than having Israel fight at all, he would non-violently relocate the Canaanites with “hornets” so that Israel could peacefully enter the land (971). God was going to use these hornets to drive out the Canaanites (Ex. 23:29–30)—an expression of God’s early hope to nonviolently relocate the indigenous Canaanite population (i.e., “vomit” them out [Deut. 7:15, 18–19; Ex. 23:20–23; Lev. 18:24–25]) (12). Several problems arise. First, even before we get to Exodus 23’s “hornets” language, Israel has to take to the sword to defend itself against Amalek (Exodus 17)—a justified coercive force, much like Israel’s peaceful intentions toward Sihon and Og in Numbers 21. Second, what of God’s threat that the land would “vomit out” the Israelites if they disobeyed? This happened through coercive military force—the Assyrian and Babylonian invasions. Third, the “hornet” language associated with the use of coercive force is found elsewhere in the Deuteronomy and Joshua: Deuteronomy 7:20–24, “perish”; “destroyed”; “perish”; “destroyed”; Joshua 24:11–13; in fact, Joshua 24:11–13 brings together (i) the “hornet,” (ii) God’s granting a military victory (“the hornet . . . drove out the two kings of the Amorites”), and (iii) Israel’s fighting trusting in the Lord (cf. Heb. 11:30–31) rather than in dependence on the sword. Furthermore, the NT reflects on these texts and takes for granted divinely commanded wars and celebrates their victories (e.g., Acts 7:11; 13:9). It’s hard to square Boyd’s view with Hebrews 11:30–31: “By faith the walls of Jericho fell down. . . . By faith Rahab the harlot did not perish along with those who were disobedient.” The text goes on: “by faith [they] conquered kingdoms . . . became mighty in war, put foreign armies to flight” (vv. 34–36). The NT gives no indication that Moses and Joshua misinterpreted God’s intentions—indeed, the opposite. Yet according to Boyd’s lights, the author of Hebrews should say: “Because of their sinful cultural conditioning and the hardness of their hearts, they conquered kingdoms . . . became mighty in war, put foreign armies to flight.” OT scholar John Goldingay correctly observes: “If there is a contradiction between loving your enemies and being peacemakers, on one hand, and Joshua’s undertaking this task at God’s command, on the other, the New Testament does not see it” (3). We can agree in part with Boyd on various things, including divine accommodation to human fallenness (Matt. 19:8) and the language of divine sovereignty that includes the influences of moral agents (e.g., God’s permitting parents to cannibalize their children [Jer. 19:9] though not actually causing them to do so). Yet Boyd in a number of places goes against what both Old and New Testaments affirm. He misrepresents both Testaments, claiming that Moses himself is hard-hearted and violence-prone. He speaks inaccurately about the Mosaic law both in his denial of a divinely mandated death penalty and in his claim that Jesus challenged the Mosaic law itself—not just flawed interpretations of it—in the Sermon. Boyd’s commitment to pacifism leads him to label all coercive force as unjust and “violent”—a term he never defines. However, we witness the use of just coercive force in Jesus’s temple-cleansing, Paul’s benefiting from the Roman “sword” in Acts 23 (in keeping with Rom. 13:4, 6), Elymas’s being struck blind by “the hand of the Lord,” Jesus’s threat to cast Jezebel on a sickbed and “strike her children dead,” and likely more (e.g., Ananias and Sapphira, Corinthian deaths through abusing the Lord’s Supper). A further difficulty in embracing Boyd’s view is that it misuses OT texts like Nehemiah 9:24, ignores the weight of OT texts indicating legitimate coercive force for self-protection (hardly a picture of “trusting in the sword”! ), can’t readily account for Moses’s “compassionate” defense of Israel when God wants to destroy the nation and start over (Exodus 33), and glosses over the NT’s affirmative commentary on these OT texts (e.g., Acts 7:11; 13:9; Heb. 11:30–31, 34). Boyd’s view of cruciformity lacks the robustness and breadth portrayed in the New Testament by Jesus, Paul, and other authors. Boyd’s assumption that only demons or humans—not God and Christ—engage in coercive (“violent”) force isn’t borne out by the evidence. True, God displays his wrath by withdrawing his presence. Yet God also actively judges (punishes) as well—and not just redemptively and restoratively, but also retributively. This matter of punishment plays a role when it comes to the doctrine of penal substitution, which Boyd misunderstands or inadequately explains. This side of the new heavens and new earth, God will often issue commands and act in less-than-ideal ways in response to a fallen world; even Jesus might have to resort to striking people dead (Rev. 2:23). Humans too may need to engage in divinely commissioned just coercive force, as the Anabaptist Schleitheim Confession acknowledges. In any event, it appears that Boyd will have to join us “synthesists” in order to deal consistently with some of the difficult OT (and, it turns out, NT) texts—or continue to embrace what appears to be a diminished view of Scripture. For these and other reasons, Boyd’s view of cruciformity lacks the robustness and breadth portrayed in the NT by Jesus, Paul, and other authors. And despite his commendable desire for a Christocentric hermeneutic, his interpretive method must include not only kindness, but also a greater emphasis on divine severity and heavenly vengeance for which the redeemed martyrs cry out. I used to think that wrath was unworthy of God. Isn’t God love? Shouldn’t divine love be beyond wrath? God is love, and God loves every person and every creature. That’s exactly why God is wrathful against some of them. My last resistance to the idea of God’s wrath was a casualty of the war in the former Yugoslavia, the region from which I come. According to some estimates, 200,000 people were killed and over 3,000,000 were displaced. My villages and cities were destroyed, my people shelled day in and day out, some of them brutalized beyond imagination, and I could not imagine God not being angry. Or think of Rwanda in the last decade of the past century, where 800,000 people were hacked to death in one hundred days! How did God react to the carnage? By doting on the perpetrators in a grandfatherly fashion? By refusing to condemn the bloodbath but instead affirming the perpetrators’ basic goodness? Wasn’t God fiercely angry with them? Though I used to complain about the indecency of the idea of God’s wrath, I came to think that I would have to rebel against a God who wasn’t wrathful at the sight of the world’s evil. God isn’t wrathful in spite of being love. God is wrathful because God is love. Paul Copan is professor and Pledger Family Chair of philosophy and ethics at Palm Beach Atlantic University in West Palm Beach, Florida. He is the author of many books, including Is God a Moral Monster? : Making Sense of the Old Testament God, Did God Really Command Genocide? : Coming to Terms with the Justice of God (with Matt Flannagan), and The Gospel in the Marketplace of Ideas: Paul’s Mars Hill Experience for Our Pluralistic World (with Kenneth Litwak). Do You Reflect God’s Love?